The leadership of the All Progressives Congress APC says the new N145 pump price of petrol will crash within thhe next three months. 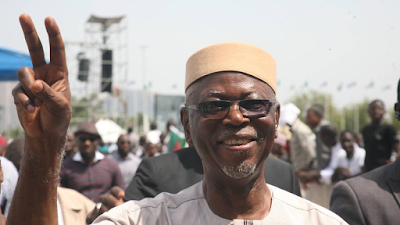 In a media briefing with newsmen in Abuja yesterday May 13th, the Chairman of the party, John Odigie-Oyegun, says just like the Global System of Mobile telecommunication, GSM, the price of fuel is bound to reduce due to competitive market forces. “From our point of view as a party, it has become necessary to fully and in order to recover from the economic situation which we have been plunged to totally free the economy and let the normal laws of demand and supply operate. Of course, with government standing by to protect the long suffering Nigerian who is at the margin. If is unfortunate, it is painful what has happened, it will increase cost in all directions. But in the medium term, in three months at best, I foresee that the prices will come crashing down when there is availability. NNPC will continue to be in the field anyway either through the refineries whenever our pipelines are allowed to function or through importation and so will continue to be a player in the fuel supply market. Prices are bound to come down. A typical example is what happened when mobile phones were introduced. I remember that I bought a SIM card for over N30,000, but today, it is virtually free. If we free the fuel market, that same thing will happen which was as a result of competition is likely to happen. “Over time, the subsidy regime has become so intensely manipulated, so abused that it really was no longer operating in the interest of the Nigerian public. I think that it has become very clear that the kind of queues that has become endemic over several regimes in this nation is a clear indication that something has gone seriously wrong with the subsidy regime. Those who were privileged were exploiting it to amass more wealth. Meanwhile, the people for whom it was basically meant had to bear the cost in higher transport fare. Each time these queues develop, of course the ordinary Nigerian bears the cost while the importers and manipulators of the system are the ones that makes all the money. If the region of subsidy is to be reintroduced, it can only divert resources from the crying needs of other sectors, including the programme to help the Nigerians living at the margin. So, the appeal which is a very sincere appeal to the Nigerian people; yes there is a lot of hardship, yes increased pump price will also increase that hardship. But the economy is being freed in a way that the ordinary Nigerian will become the major beneficiary and we are talking of a matter of months from removing this one last bottleneck that has held the Nigerian economy down. So, it is an appeal and we should watch what happen in the next few months as far as the fuel issue is concerned because I am sure it will come crashing down. In any case, it will free resources eventually that will be used to create good jobs which has been promised and improve the lot of the Nigerians at the margin.